90 Ball Bingo is the most famous version of bingo. Players opt-in to a 90-ball bingo game by buying numbered bingo tickets. A caller calls out numbers randomly and if they appear on a player's ticket, the player covers them or 'daubs' them. The 1st place winner is the player that covers any 1 line pattern, the 2nd place winner covers any 2 line pattern and the Full House winner covers all 3 lines on the ticket. 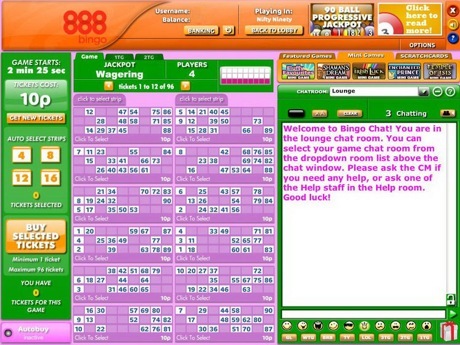 Freebie Fun: this progressive jackpot is offered by both 888Bingo and WinkBingo sites. It can be found at Great £1000 Weekly on Monday's @ 10:30pm, Freebie Fun daily @ 10am - 10pm, and at The Ten Den room daily @ 7am - 10pm at 888Bingo. You can also play for the jackpot at the following WinkBingo rooms: WEEKLY £1000 FREEBIE on Mondays@10:30pm, FREE TENNERS daily from 10am-10pm, FREE FOR ALL daily from 7am - 10pm, POWER GEM on 27th of month. Tickets are free. Create the perfect atmosphere with your favourite landscape. A portion of every ticket price goes into the progressive jackpot. Tickets cost from € 0.10. You can buy up to 60 tickets. The jackpot starts at 100 euros and increases until someone wins it. Simply bingo a Full House within 40 calls or less and win that games Jackpot. When the Progressive Jackpot is won, it will then start from $/€/£100 again (based on your currency). Running 24/7 in all of 888bingo's 90 ball rooms, It's time to party and win a huge progressive jackpot!